Is giving back to the community a part of your New Year's resolutions? New to the area? Have you been meaning to get involved in the LGBT community and haven't really known how to start? Come learn how to volunteer with The DC Center and its various Programs! Our next orientation will be held on Saturday, April 9th from 12PM to 3PM, and will be presented by Program Manager Brant Miller. 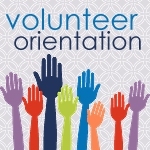 This orientation is required for all new Support Desk Volunteers and encouraged for all current Support Desk Volunteers. Others who currently volunteer or wish to volunteer at The DC Center are also welcome to participate in this training. Come learn how to help the community and have some fun! Washington, DC 20020 Come and share in reading, writing, and discussing the works of a creative genius who was a novelist, playwright, poet, civil rights activist, lecturer, essayist, preacher, and lover of humankind -- Mr. James Baldwin! His ideas inform the present and the future, and they need to be shared today. Come, learn, and share what you know. Never read Baldwin? You are in for a treat! Read him in school a long time ago? Join the new conversation with your reflections! Speakers, music, dance, a little drama, and light refreshments will be the order of the morning. You don't want to miss this opportunity. A Poetry and Art Contest will also be held. Submit poetry and/or artistic creations that reflect the life and/or works of James Baldwin. Entry must be received no later than Saturday, April 9, 2016. Winners of the poetry and art contests will be announced during this program. Both contests are open to all ages. Contact Pat Badford, 202-679-4819 or patbrad2@verizon.net for more information or to R.S.V.P. The Golden Crown Literary Society is happy to announce its 12th annual conference will be held July 6 to July 10, 2016 in Alexandria, Virginia at the Hilton Alexandria Mark Center. The Golden Crown Literary Conference is the best opportunity for readers, authors, aspiring writers, editors, publishers, and media to learn about and meet colleagues as they explore lesbian literature. Lesbian literature is defined as having a lesbian as the main protagonist, or addresses/explores important lesbian issues. From its modest beginnings in 2005, the literary conference has grown into a four day literary event. This year's GCLS conference will offer many panels, seminars, and workshops for readers and authors. Every hour we spotlight five authors with readings and chats, and there are many evening social events. Sponsors providing generous support and hosting events include CURVE Magazine, Bella Books and Bella Distribution, Bywater Books, Affinity eBook Press, and Regal Crest Enterprises. The final night of the conference is the GCLS Annual Awards Night, where the "Goldies", (the Golden Crown Literary Awards) for excellence in lesbian literature are announced. Since the first Goldies were awarded in 2005, the categories have expanded from three to fourteen. In addition there are special awards for Trailblazer, Classic Book Award, Directors' Award, and more. Membership in the GCLS is not required to attend this event. OutWrite is a celebration of LGBT Literature. The weekend is full of book readings, writing workshops, book discussions, poetry readings and more. Several book LGBT publishers regularly exhibit at OutWrite. We will have both new and used LGBT books for sale all day long on Saturday August 6th. The 6th Annual OutWrite LGBT Book Festival will take place Fridya August 5th through Saturday August 6th with most events taking place at the Reeves Center in Washington DC. Most of the book readings and the exhibit hall will take place on Saturday August 6th. Please watch this space for more information about future to participate in upcoming planning meetings.